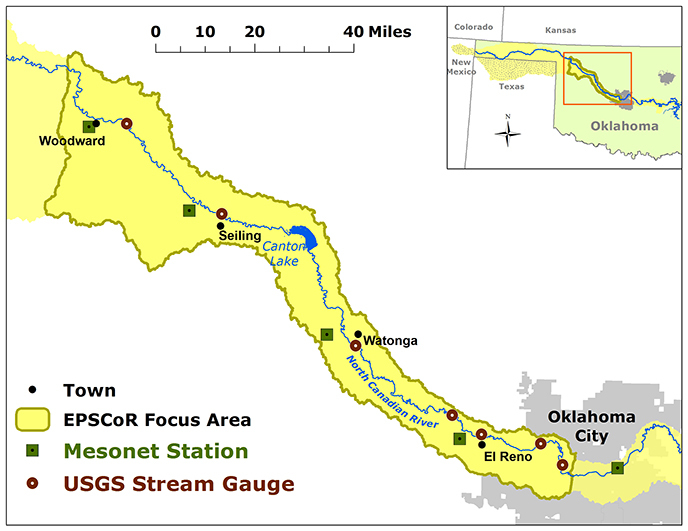 The Oklahoma NSF EPSCoR team's over-arching research goal in the North Canadian River Watershed is to assess the study area's vulnerability and resiliency under the influence of drivers of change (climate, human behavior, public policy, land use and woodland encroachment) using an integrated coupled human-natural systems approach. The North Canadian River originates in far northeastern New Mexico and travels eastward into the Oklahoma Panhandle, occasionally dipping down into the Texas Panhandle. It continues in a southeastern path towards Oklahoma City, and then travels eastward to its confluence with the Canadian River at Lake Eufaula. In the Oklahoma Panhandle, this river also goes by the name Beaver River. The entire basin area covers roughly 15,038 sq. miles (38,948 sq. km). Within Oklahoma only, the basin covers approximately 9,097 sq. miles. The watershed encompasses several lakes: Optima Lake, Canton Lake, Lake Overholser and Lake Eufaula. The Oklahoma EPSCoR team has focused much of their effort on the middle portion of this watershed, which covers approximately 1,849 sq. miles, part of which lies within the Oklahoma City Metropolitan Area. Using Oklahoma Mesonet data, we calculated the range of average monthly temperatures and precipitation totals, and an overall monthly average for each of those variables. Average monthly summer temperatures in the North Canadian range from the mid 70s to upper 80s, with an overall monthly average temperature hovering right around 80ºF for both July and August. Winter temperatures range from near freezing (32ºF) to the upper 40s, with an overall monthly average temperature lingering near 37ºF. Two precipitation maximums occur during the year for this area. The primary maximum often comes during May and June, where precipitation averages roughly 4 to 6 inches each month. A secondary maximum occurs during October, where as much as an additional 10 inches of precipitation can fall. 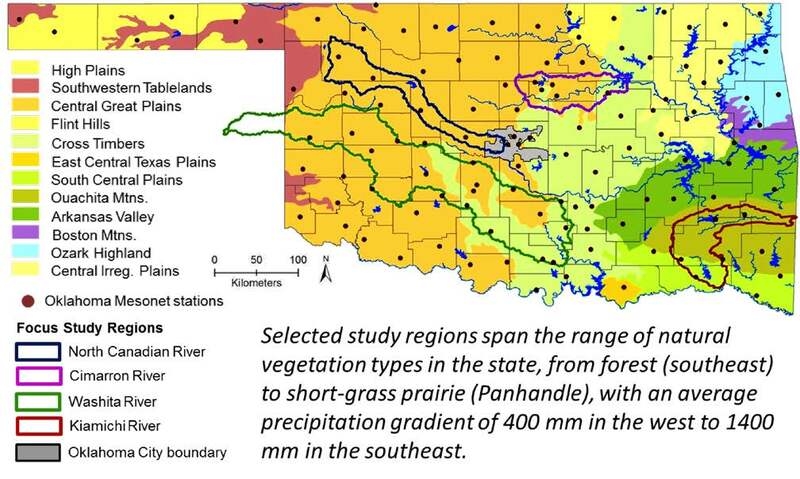 This study area was chosen because it feeds the primary water supply reservoirs of Oklahoma City and spans rural areas in Oklahoma that are projected to experience increased impacts from drought and water shortages. Near Canton, Oklahoma, the North Canadian river flows into Canton Lake, a reservoir used by many Oklahomans as a source of drinking water. As the river nears the Oklahoma City Metro, it flows into Lake Overholser, one of the primary drinking water supplies for the residents of Oklahoma City. As water shortages become more of an issue upstream, less water will be available for the downstream reservoirs. The North Canadian River Watershed stretches across the Central Great Plains ecoregion. Much of the grassland in this area is now being used for cattle grazing. According to the Oklahoma Conservation Commission, over half of the landscape in this watershed is covered by either winter wheat (~38 %) or pasture land (~35 %). The wetlands that are scattered throughout this region are key to the Central Flyway migratory birds. In the 1930s Dust Bowl, much of this landscape was stripped of its topsoil due to the heavy cultivation. Today, much of the landscape has recovered, but is still primarily being used for cultivation and grazing. There are only two locations where native grasslands have been protected: Wichita Mountains and Great Salt Plains Lake.